There are certain things from childhood that tend to stick through out your life. Certain memories, associations. Positive, negative. Good and bad. It could be an overly strict teacher of mathematics who didn’t exactly help you in getting stronger with the numbers but rather increased in you the fear of him and his cold steel ruler being smacked on the hand. Which leads to a life of issues with numerics and numbers and math based subjects or fields even. Just an example of course and probably as severe as that may have come across. Another could be the morning cartoons just before heading off to school. Catching them on the tube just as you are catching breakfast in the tummy. Good times. Good fond memories from childhood. I went to sea view last weekend and was reminded of one such childhood association. The music of the ice cream man’s bell. The ice cream man may not always have been in a fancy trike. 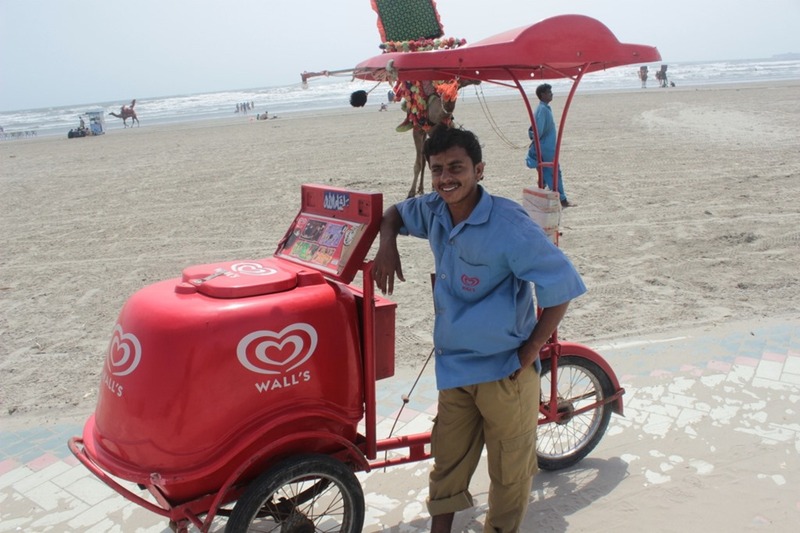 He may not always have been selling a variety of different and fancy ice cream. But he did always hold the promise of the perfect thing on a hot summer day. In it’s very basic and simplest – ice cream. The music of the ice cream man would bring kids to the gate, adults in tow so that those wonderful things can be purchased. Why was I reminded of this while visiting sea view? Because I ran into the ice cream man of today. Music still pretty much there. Fancier trike. Fancier ice creams. This one in particular quite happy to get his picture taken. A hard day’s work in progress, biking through the heat and humidity to sell the very things that could provide relief against the elements of summer. Ice Cream. Lollies, chocolate cones, vanilla cones, fancy chocolate and nut bars and what not’s. He had done his research on the competition too. He was convinced not only in this that Walls was the better brand but also that they were the better employers. Perks, benefits and salary aside – the maintenance and general expenses of the trike were borne by the company / distributor he was working for whereas according to him with the other brands this was not the case. That’s not the point. Point is the guy was happy at that moment in doing his job, pushing his mini freezer of ice cream treats and posing for a camera. When is business good? ‘Only on the weekends now.. especially at sea view because a lot of families come. They aren’t the source of joy they once were for kids.’ Maybe the trend has gone down. Maybe it has gone down segment wise or in certain parts of the urban society. But what other choice does he have – a statement that is said with that all too familiar wry smile. A smile at well…circumstance. So he pushes his bike and continues to play that music, hoping to sell out his inventory for the day before the sun sets.